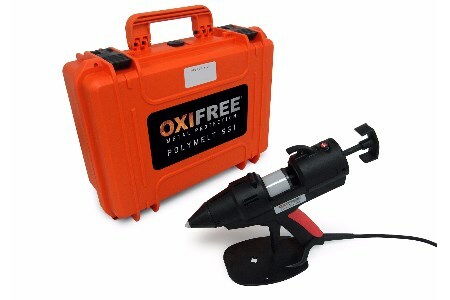 Oxifree Global will be showcasing its revolutionary new Polymelt Service Gun (SG1) at the Abu Dhabi International Petroleum Exhibition & Conference (ADIPEC), 7 - 10 November 2016. The new SG1 is a handheld, portable applicator designed for filling in sections of Oxifree TM198 coating that have been removed for inspection. It has been developed to further ease maintenance costs for asset owners within the oil and gas industry. Thermoplastic coatings are in high demand, particularly in the Middle East, where environmental factors like abrasion and corrosion mean that metal components need replacing quickly. Oxifree Global’s thermoplastic coating, Oxifree TM198, is an organic, patent protected formula that helps to combat corrosion and has been proven to increase the lifetime of metal components and reduce maintenance costs by at least 40%. Oxitape further aids asset owners by allowing them to bring the benefits of Oxifree TM198 to an even wider range of applications and environments. Applied over Oxifree TM198, it creates a defensive shell that offers complete protection from contact, corrosion and contamination. Now, with the new SG1, asset owners are able to easily reapply the coating themselves in small areas in situ, without the need for specialist technicians. Oxifree Global will be exhibiting the SG1 at ADIPEC, 7 - 10 November 2016, on stand 8351.